Riding on mountain roads needs special attention, and even a minor loss of concentration can result in accidents. Here is a video, which has surfaced online, that shows how dangerous mountain riding can be. It involves a Bajaj Dominar, a Honda CBR 250 and a Hero Super Splendor. The video shows a Honda CBR 250R and a Bajaj Dominar riding on the twisting mountain roads. The video has been taken from the helmet cam of the Dominar rider and it shows both the bikes taking the twists smoothly. Suddenly, a Hero Super Splendor appears from a blind turn and almost collides with the riders. The whole incident got covered on camera. Soon after the close call, the riders on the Honda CBR 250 and Bajaj Dominar take a U-Turn to chase the person who almost hit them. After stopping the person, the group starts shouting and screaming in the middle of the road. Allegedly, the rider was drunk, as heard on the camera, but there has been no police report or tests done to verify the same. The rider explained that he had lost his balance and that’s why he entered the opposite lane. The group of bikers display road rage, which is ill-advised. Road rage can aggravate the situation and can make things worse. There have been many cases of road rage where the victims suffered severe injuries and sometimes, fatal ones too. It is always a good idea to maintain calm and not engage in road rage. Anger can make things much worse. 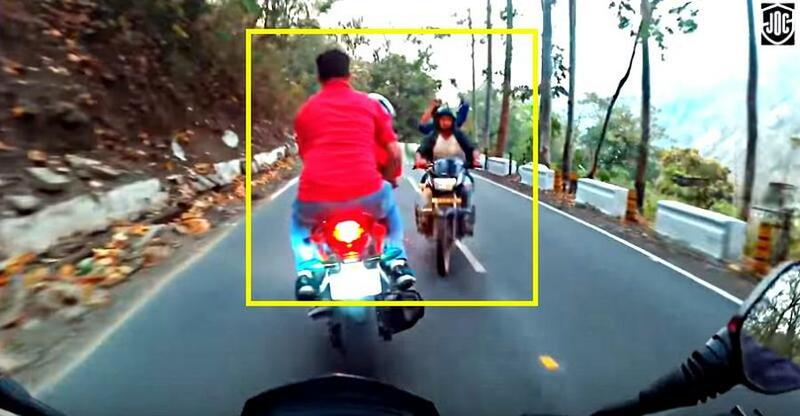 Also, the pillion rider was not wearing a helmet, as can be seen in the video, which is very dangerous. Riders should wear protective gear like helmets all the time. Riding or driving in the mountains can be extremely dangerous if certain rules are not followed. Mountain riding can be highly enjoyable if a few rules are kept in mind. Here are a few such rules that can make the mountain drive or ride a much better experience. Maintain lane discipline on the mountains. Most mountain roads do not have a divider and entering the opposite lane, especially on blind curves can cause accidents. Never park your vehicle on blind curves. The vehicles coming from both sides will not be able to spot the parked vehicle in time and can cause accidents. Always overtake with a clear view of the road ahead. Overtaking in the mountains can be dangerous. Always overtake after ensuring that there is no other vehicle in the opposite lane. Never drive down in neutral. Always keep the engine switch on and the vehicle in gear. Constant use of the brakes reduces the efficiency of the brakes, and the speed can be uncontrollable while coming down. Maintain speed on the mountains. At high speed, the vehicle can go into the opposite lane while taking a tight corner. Always keep the speed of your vehicle under check.